The Deluxe Universal Wind Triangle & T/S/D 4-color computer calculates flight planning and en route navigation requirements. The unit includes wind slide speeds of 40 to 270 kts or miles, color-coded conversion scales, slide lock, flush compass ring, and write-in TC to CH boxes. 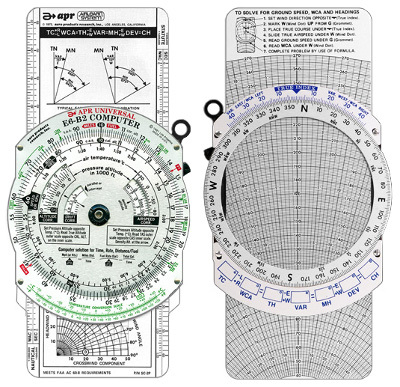 The slide has Nautical and Statute rulers for Sectional and WAC charts, typical east/west magnetic variation diagrams, wind triangle definitions, true heading and true course solutions, and a headwind and crosswind component grid. Instructions to solve for ground speed, WCA, and headings are printed on the computer and make learning faster and easier. The Time/Speed/Distance computer provides all major navigation computations. The flight planning side of the wind triangle slide shows formulae for true course to compass headings as well as illustrated examples of east/west magnetic variation. Also displayed are definitions relevant to wind triangle problems and diagrams of true heading and true course solutions. The headwind and crosswind component grid depicts the relative wind angle in a multi-color graphic for accurate and easy interpretation. Nautical and Statute scales for Sectional and WAC Charts are printed on the sides of the slide. MEETS FAA AC 60-8 REQUIREMENTS. Custom case. Lifetime, anodized aluminum. Dimension: 4 7/8" x 9 5/8". Also available in a smaller "pocket" size as the APR E6-B4T. Complete Instruction Manual includes BONUS Section on Dead Reckoning and Wind Effect Theory Calculations. Size 4 7/8" x 9 5/8" 4 7/8" x 9 5/8" 3 1/4" x 6 3/8" 3 1/4" x 6 3/8" 4.5" x 8.75" 4.5" x 8.75"
Review: When I stopped flying 35 years ago, I was using a Jeppesen CR-5. When I returned to flying last year, people were more into the E6-B so I tried several brands and found the APR had one of the smoothest operations of all. I still believe that the CR-5 is more accurate and the wind calculations more precise. However, the average GA pilot doesn't need that level of accuracy. The APR E6-B2D is a fine calculator that does what it's suppose to do and does it without the sticky movement that I experienced in some brands.